Michael Andrew is a 19 year old professional American swimmer who competes in every stroke. He races in fly, back, breast and free events individually, as well as, IMs and medley relays. Michael is trained by his father in his backyard with Ultra Short Race Pace Training (USRPT). He swims between 2500 to 3000 yards each day at racing speed and intensity, while keeping technique a top priority. Michael has been representing team USA in various international swimming competitions since 2015. He was given the title of FINA Male Swimmer of the Meet at the 2015 FINA World Junior Championships. Michael performed exceptionally well at the recently concluded 2018 Phillips 66 National Championships, where he won 4 senior national titles, beating out 3 Olympic medalists for the 100m breaststroke gold. He also smashed championship records in the 50m butterfly and 50m breaststroke at the same meet. We looked at Michael Andrew’s 100m breaststroke to analyze his metrics across 3 competitions (2016 Arena Pro Swim Series, 2016 Olympic Trials, 2018 Phillips 66 National Championships), see how his performance changed over time, and compare his metrics against the athletes he was racing against. Michael swam significantly faster at the 2016 Olympic Trials and 2018 Phillips 66 Nationals than at the Arena Pro Series, clocking in a time over 4 seconds faster in both the latter meets. Though the average speed of the heat was generally slower at the Arena Pro Series, Michael’s speed fell below the average. The competition was faster at both the Olympic Trials and the 2018 Phillips 66 Nationals, but Michael rose to the occasion, generating more speed on average than the rest of the heat. The increase in Michael’s speed at the Olympic Trials and Phillips 66 Nationals can be attributed to the increase in his DPS. His stroke rate across the 3 meets remained fairly the same, with only slight differences, but his DPS saw a large increase, resulting in improved speed. This was also reflected in his stroke - he took around 2 strokes less per lap at the Olympic Trials and Phillips 66 Nationals. His strategy across all 3 competitions was to take slower, but longer pulls. On average, he took each stroke between 0.1 - 0.2 seconds longer than his competitors, but also gained more distance with each stroke. 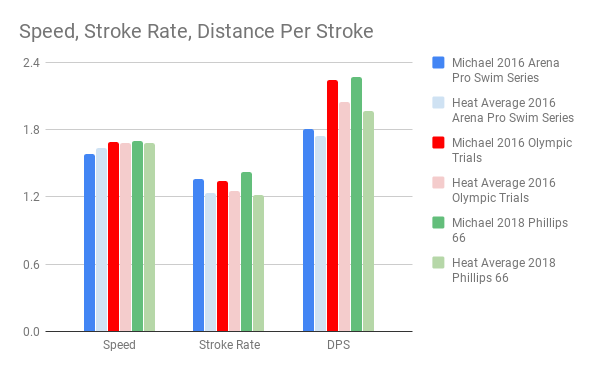 Michael’s higher DPS at the Arena Pro Series and Phillips 66 Nationals, combined with his higher speed, led to improved overall efficiency, measured through stroke index. 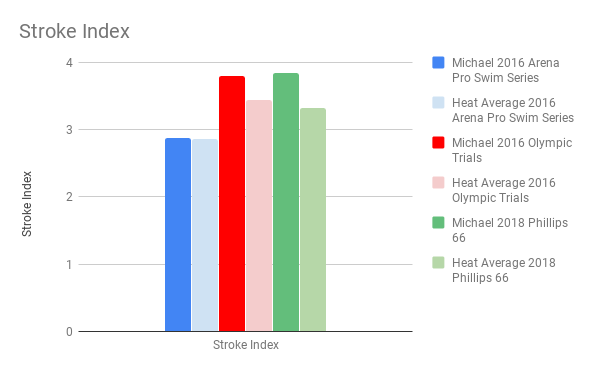 Though the difference at the Arena Pro Series was minimal, on average, Michael had a more efficient breaststroke than the rest of the field in all 3 meets. 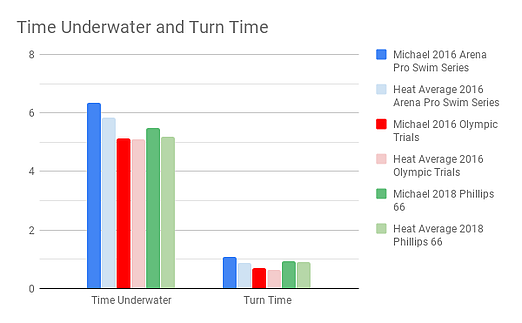 Michael did not spend as much time underwater at the Olympic trials as he did at the Arena Pro Series and Phillips 66 Nationals, but generally had longer time underwater than his competition. An improvement in his turn time can give him even more advantage on the transitions, as he had a slower turn time than his competitors in all 3 meets. Michael had a significantly slower stroke rate than his competitors, but he more than made up for this by swimming with the most efficiency. Given his stroke rate, poor form would not have resulted in his high DPS or speed. His high DPS could have easily produced bad results if his stroke rate had gone too slow. Finding the delicate balance between stroke rate and DPS allowed him to capitalize on the momentum form each of his strokes, pausing just the right amount in the recovery to maintain his speed. How Much Faster Can You Get with TritonWear?